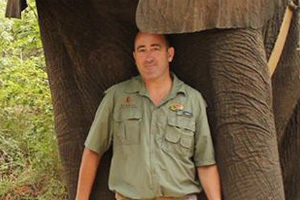 Hayden was born in South Africa, and started guiding professionally in 1997. He has successfully guided safaris and specialist avifaunal trips to countries such as South Africa, Mozambique, Swaziland, Lesotho, Botswana and Zambia. He has also undertaken avifaunal (the birds or the kinds of birds of a region, period, or environment) assessments in areas such as the far northern reaches of Mozambique; areas so remote that they were last researched in the 1940s. Hayden's passion is birding, photography, and exploring, and he is constantly on the lookout for exciting new destinations and experiences to introduce to our clients. He is constantly in tune with his environment, and the knowledge that he will pass on to you is the result of many years of hands on experience gained in the African bush. Hayden also comes with a vast knowledge of African countries, languages, and customs that ensures that our clients enjoy a true adventure. In 2003, one of his tours, "Crossing the Barrier of Spears," was chosen as one of the top 25 trips in the world by National Geographic Adventure Magazine. Hayden is an avid photographer, and a number of his photos have won prizes in local competitions and have been featured in magazines in South Africa.